Security testing is very much self-explanatory. By the name itself one can figure out that it relates to a technique to strengthen the security. 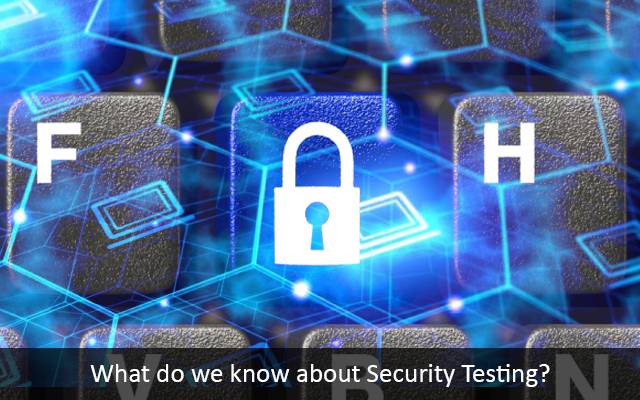 But is Security testing just a testing to protect data and information functionally? It’s much more than that. Security testing hosts a whole lot of functionality. How well do we know about Security testing? Do we know enough about it? Well. It’s time for us to know about it since in this tech age, we are vulnerable to various breaches. These principles form the corner stone for any security test. In order to determine whether your security testing is successful or not. You have to rely on these principles. Sounds similar to that of resource management, but are quite the opposite. Confidentiality is a process where things are kept private. Not everyone or perhaps no third party is aware of the test. The matter is kept confidential within an organization. Integrity refers to protecting information so the unauthorized parties aren’t able to modify it. Authenticity showcases the legitimacy of any desired software. Authorization cannot be defined better than the access control which is under the hands of a particular individual. Availability refers to the assurance for the provision of information & communication services as and when required. Non- Repudiation is to avoid any conflict between sender and receiver on the basis of ultimate denial. That it when the Non-Repudiation principle comes into play. The aforementioned principles were the basics of security testing. Let’s learn more about the process. Every application that has been created has been done so with the help of a database. Structured Query Language (SQL) forms the basis for this. Now when all the above principles fall short somewhere. The language becomes vulnerable to the unauthorized sources. Now this takes place due to several reasons. One of the major reason is an organization does not focus on the security aspects as much as it does on the other aspects such as infrastructure and access codes. The shortfall in the security aspects leads to its breach. What is a Security Test? Security Test is overly a process which is concerned with the testing of the security. And to ensure that the test turns out to be successful. There are four major steps to take care of. In order for any modern day organization to work properly. It is pretty much mandatory for them to get these four things to a perfect place. A lack of any of these may cause serious concerns over the security of the database of a particular organization. Data Access refers to the accessibility of any data. There are only a few people or a particular individual that is allowed or should be to access any important database. The data if falls in the hands of an unauthorized individual. It may lead to misuse which can turn out to be a horror for any organization. Network security refers to the level at which a network is secured. There are various levels in network security. The important the data, the higher should be the level of network security. Authentication refers to authenticity of any program. A stage where certain information is revealed to make sure that people are aware about who is heading or owning a particular program. Encryption is some kind of common information. For example: specific password. Encryption is the last step of a security test and indeed the most pivotal one. If there is a short come in any of these parameters the test may turn out to be unsuccessful. In order to ensure smoothness. The importance of a security test is required to be understood before its too late. This entry was posted in mobile application security testing, moible application penetration testing, security code review, security testing company, web application penetration testing, web application security testing.